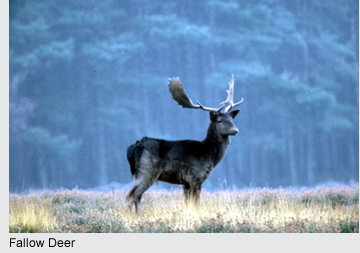 There are four species of wild deer established in Scotland; roe deer, red deer, sika and fallow deer. Roe deer and red deer are native species; they colonised Scotland naturally after the end of the last glaciation around 10,000 years ago, and wild populations have survived in Scotland since then. Sika and fallow deer have both become established following introduction. The red deer is the largest native land mammal in the UK and is found predominantly in the open hill range, characteristic of much of upland Scotland, also using woodlands and plantations, particularly for shelter. 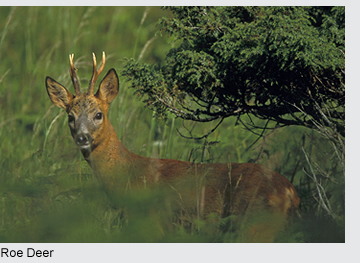 Although red deer may be the most recognisable species to many, roe deer are in fact the most widely distributed species across Scotland - mainly woodland dwelling and found throughout mainland Scotland including around urban centres. 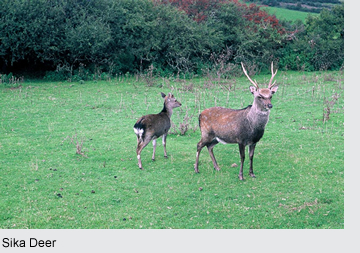 Sika and fallow deer have become established as a result of deliberate releases and escapes from deer parks. Fallow deer were introduced from the Mediterranean to England, possibly during the 11th or 12th centuries. They occur in Scotland mostly around areas where they were originally kept in captivity. Sika deer were introduced from Japan into UK deer parks in the 19th century and the earliest records of their escape from captivity date from the 1920s. They are more widespread than fallow, with populations spreading in the south, west and north of Scotland. With no natural predators in Scotland (since the extinction of the wolf), wild deer populations tend to increase and are therefore managed by man principally because of their interaction with other land use and management objectives as a result of grazing, browsing and trampling. The total population of wild deer in Scotland is not known, but counts are made at a more local scale in order that numbers can be managed according to the impact that they have. In practice this means that deer numbers need to be reduced in some areas in order to reduce the impacts of grazing, trampling or browsing, to allow management objectives to be achieved. At a national scale it is clear that roe, red and sika populations have risen significantly in recent decades. Indications suggest that this trend is continuing; the numbers and distribution of roe deer are expanding, red deer populations are increasing in their distribution and sika deer continue to expand their range. Fallow deer numbers appear to remain steady in isolated populations. The legal framework for wild deer management derives from Scots law, under which deer are regarded as a common resource in that they belong to no-one until they are killed or captured. The right to shoot deer generally goes with the ownership or occupation of land. This is a different model from many other European countries and reflects the wider structure of rights over land and natural resources in Scotland. 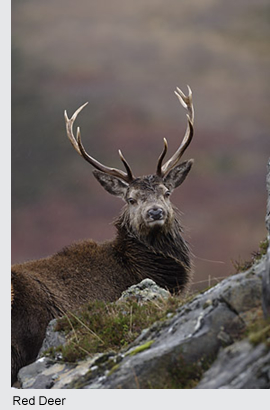 Deer management is carried out by land managers on estates, farms, crofts and through recreational stalking. These deer management activities including stalking currently support several thousand jobs in Scotland. Taking into account related goods and services, this activity makes a significant contribution to the rural economy, often in areas where employment and economic opportunity is relatively limited. A survey carried by PACEC for the Association of Deer Management Groups published in 2006 found that deer management in Scotland supports the equivalent of 2520 full-time jobs each year. The annual value of this to the Scottish economy, taking into account related goods and services, was estimated as £105 million for 2005.